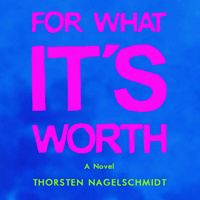 Join the German Department on Wednesday, April 24 at 2:00 pm for a reading and discussion with author Thorsten Nagelschmidt and translator Tim DeMarco from the novel For What It's Worth. This event will take place in ICC 450 and will be in German and English. What to do with the windfall? – When his father dies, bohemian bartender Meise takes the unexpected inheritance and embarks on a journey. The plan? Spend, not save. He swore to himself he would do it all differently than his father. But after road-tripping across America and partying all over Europe, he doesn’t seem to fit back into his old life in Berlin. So, with the remaining money he sets out on one last trip: to a vineyard in rural West Germany. There he is confronted with a culture shock unlike any other and is forced to ask himself the questions about his own life he's been trying to avoid. Tragic yet entertaining, with acute observations and no shortage of black humor, Nagelschmidt allows his (anti)hero to fail – by his own hand or others’ is up to the reader to decide. Translator Tim DeMarco is a teacher, translator, and writer. He earned his bachelor’s degree from Georgetown University and his master’s degree from Middlebury College. He currently lives in New Jersey, where he teaches at the high school and university level.